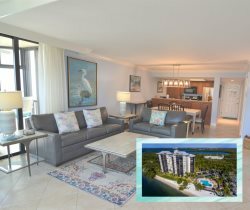 If you’re looking to rent a Sanibel Harbour condo Harbour Tower 814 is a great option. This Sanibel Harbour resort condos come with great views of the Gulf from the screened-in patio and master bedroom. Beige and green color pallet offers a relaxing vacation condo. Walk-in closet and separate tub and shower in master bath. King bed in master bedroom, two twins in guest bedroom and sofa sleeper. Wireless internet available. Everything was pleasant and easy. We had a wonderful experience. A nice relaxing weekend to start the year. Everyone was helpful and answered any questions we had before and during our stay. Perfect location, beautiful condo, great vacation experience. Thank you! Beautiful accomodations that did not feel like a vacation condo but more like I was staying at a friends home. The condo was fully equipped with a wonderful view and excellent pool area. The back porch sunset was our favorite part. The lock to the front door was very hard to open and the garbage disposal was not working properly. Other than those two minor things the place was amazing and we had a great time! The view is beautiful and 6 people slept VERY comfortable. Thank you!!! Convenient location. Owner was incredibly kind and helpful. Pool was nice. Overall great stay. Would have liked better access to a fitness center, tennis, etc. Felt prices were too high. Loved the condo #814 Harbour Towers. Beautiful view, clean! Stay was wonderful. Thank you! We really enjoyed it! It was a very nice location...loved the pool..the Marriott pool..the various restaurants...the Oceanside lounge chairs. Beautiful view. Very nice condo. The ONLY drawback was the two twin beds in the 2nd bedroom. What a wonderful vacation experience! My husband, children and I had a terrific time...great property, highly recommend it! Very friendly, professional, and provided very prompt responses. We had a little key issue on our part and the staff was very gracious and understanding! A great setting with great access to the entire area! I cannot wait to come back...the view, service, and beauty of the area made for perfect memories! Beautiful place with great amenities. Close to great dining and shopping. Pool area was not crowded which provided a nice, relaxing atmosphere. Will probably be booking again soon.